What a beautiful afternoon in Milwaukee today! Perfect weather for coffee at Colectivo’s Lakefront Café with two of my favorite MSOE colleagues, Jim and Jan. 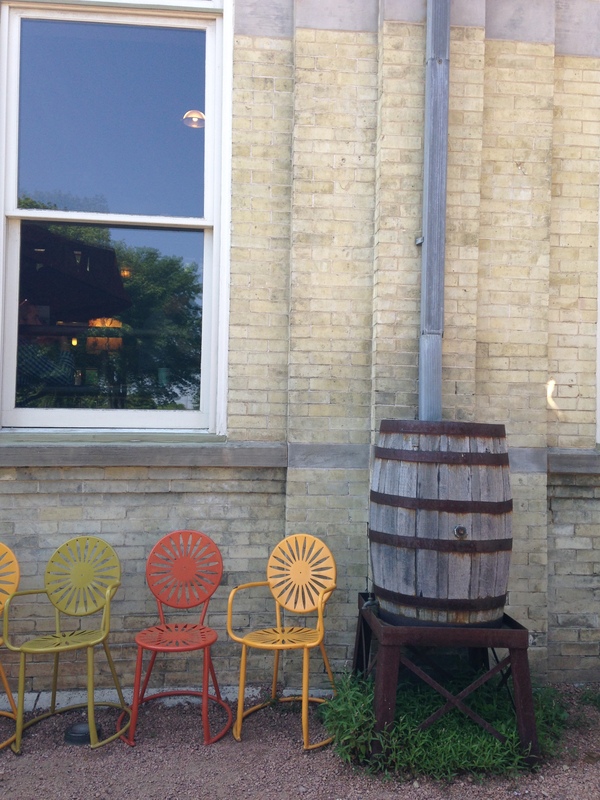 These colorful chairs and rain barrel were right next to our outdoor table. I’d never been to the Colectivo at Milwaukee’s lakefront before today. But for years I’ve admired the building, which houses the “works” of a 126-year-old engineering marvel. Built in 1888, the Milwaukee River Flushing Station pumped water from Lake Michigan down a mile-long tunnel to the North Avenue Dam, where it poured into the Milwaukee River. The fresh lake water literally “flushed” human waste downstream through the river’s downtown Milwaukee channel and then discharged itself back out into the lake. Once the Jones Island wastewater treatment plant was built in 1925, the Milwaukee River Flushing Station became unnecessary in terms of its original purpose. However, the pump is still activated occasionally to retain its functionality and to provide additional water flow during periods of hot, dry weather. Despite the fact that the building was never truly abandoned, it always looked that way to me. Enter Alterra Coffee, now renamed Colectivo, which converted the Flushing Station to a restaurant a few years ago. Kudos to the popular Milwaukee coffee chain for restoring and maintaining this historic building! Not only has Colectivo rescued a decrepit public utility, but the Café has added greatly to the life of Milwaukee’s lakefront. It’s a fun place to grab a cup of coffee while running, skating, biking, or walking, but it’s also an attractive destination in itself. The photo below is from Colectivo’s website. The Lakefront Café has great food and coffee, with indoor seating on its multi-level lofts and outdoor tables with a view of Lake Michigan’s sapphire-blue water. One reason I’d avoided the Lakefront Café before today is that I figured parking would be impossible. Fortunately that really isn’t an issue. Although parking available behind the building is limited, there’s a large surface lot (with plenty of free parking) at the marina just across the street. This entry was posted in History, Milwaukee and tagged coffee, Collectivo Lakefront Cafe, engineering, historic preservation, Lake Michigan, Milwaukee, Milwaukee River, Milwaukee River Flushing Station, MSOE, rain barrel, sewage, urban repurposing, wastewater treatment. Bookmark the permalink. Now that I know you hadn’t been to Colectivo (nee Alterra) at that location before, I’m kicking myself for never having suggested it for our get-togethers! It’s one of my favorite spots. I love that place too! Such a great location. And lovely photos you took, Katie! Thanks, Jessica! I’m so glad I finally had the opportunity to get myself over there.